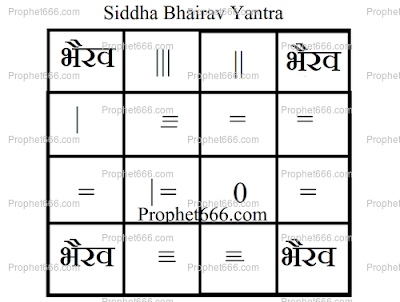 This Bhairav Siddhi Yantra, which, I have described in this post, is different from the Bhairav Yantra posted a couple of days back, which acts like an most powerful all round good luck and protection talisman. 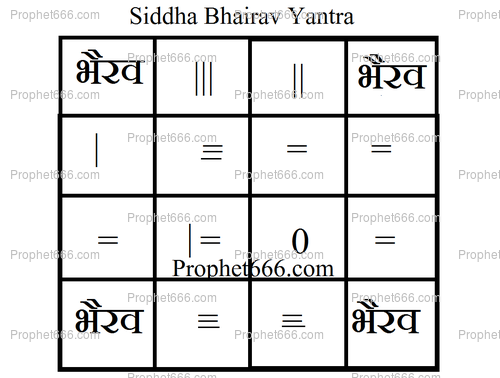 This Bhairav Siddhi Yantra, given in this post is specific for those very advanced practitioners of the Occult Tantra who are engaged in the most powerful Tantric Sadhana of attempting to invoke and have a vision of Bhairava. The Yantra is said to enhance the chances of the Sadhaka in invoking Bhairava, if it is prepared for 15 days in a row at night in a Smashan Bhoomi [Hindu Crematorium].However, the exact specifications for the making of the Yantra [the ink, pen and material] is best left to the Sadhaka as it largely depends upon the kind of invocation Mantra-Tantra experiment he is engaged in for invoking Bhairava. As pointed out above and also in many earlier posts, such Tantric experiments for invoking and having vision or Darshan of the most powerful Hindu deities like Hanuman, Kali Mata and Bhairava are extremely difficult Sadhanas and best left to those Tantric practitioner in the most advanced stages of Hindu occult practices. Guriji, Can we place 2 or 3 yantras in one locket ? I mean can I place pitra dosh nivaran yantra and videsh yatra yantra in one taabiz ? No, each Yantra or Charm should have its own locket or Tabeez and should not be bunched together in a single locket.